Blackmagic Forum • View topic - Need to Build a portable recording and streaming studio. Need to Build a portable recording and streaming studio. We have a studio, but we do travel to locations about 12-20 times a year so this has to be portable. We use both Macs and Windows to edit captured video but ideally we want to switch everything to the mac world. Down the road we will be streaming to livingasone.com but currently streaming to livestream.com. We also may be adding ProPresent module to our production. renewedvision.com/propresenter/modules . Any help would be fantastic. Re: Need to Build a portable recording and streaming studio. Maybe take the new Television Studio pro 4k. It supports 4k and have scalers at all inputs. The first ATEM which have this feature. For monitoring maybe a SmartScope Duo 4k and SmartView 4k. I dont know what to use for recording, but I would suggest „real“ a harddisk recorder. And for streaming in 4k ... ? Take a small pc and an internal card. It can be better integrated into a ready to go rack. Try to build your rack the way, you only need to connect the cameras and the internet. Thank you for your reply. We actually stream our service to 3 other locations at a time, currently in 720p but would like to get to 4k eventually. It would look a lot more crisp on our 12' rear projected screens. 3) (For Streaming) Go from that switcher with HDMI to an encoder like the livestream broadcaster or the living as one encoder? In a nutshell...yes to all 3 of your questions. Depending on your specific needs, the extra aux outputs of the 1, 2, and 4 M/E products can make it much easier to generate feeds for your multiple destinations. I suggest that you determine a form factor and start thinking about what will be placed where along with which gear you're going to use. On the road, i've found solid case builds matter just as much as the nitty-gritty of studio-in-a-box design. John Barker has an awesome small rig. Take a look! Thank you for the replies guys. I really appreciate it! 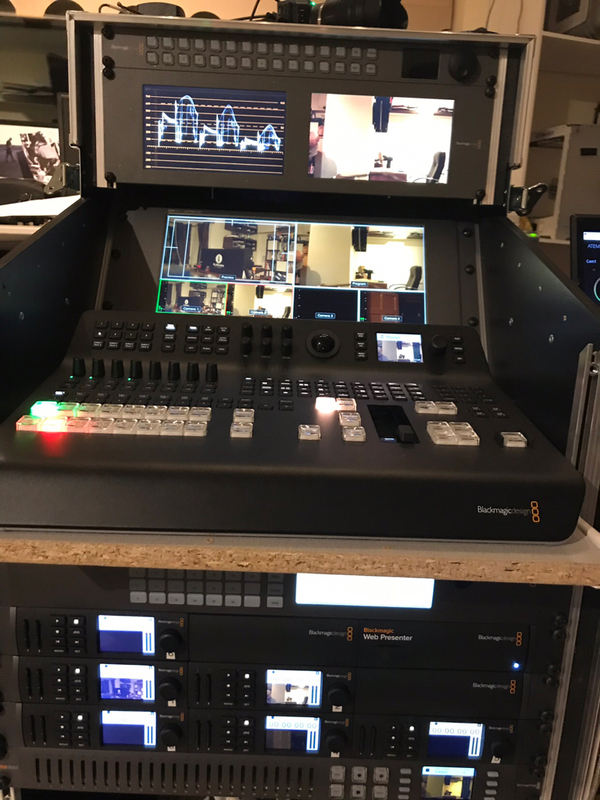 Using all BlackMagic products and the new ATEM TV studio 4K. as a springboard for my own setup. 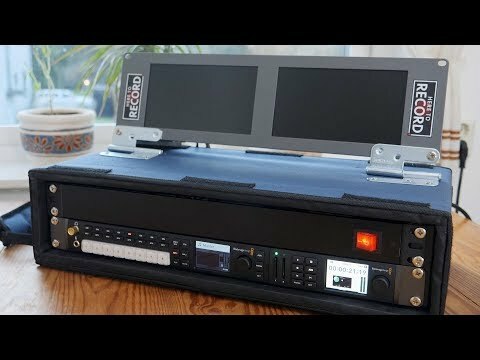 I have a 6U 19" rack case from gear4music. It's a hard case that measures 50cm x 33cm x 22cm (when open; 38cm deep (instead of 22cm) when the covers are attached). 1 of the ultrastudios attaches via thunderbolt to a MacBook Pro that runs MimoLive (for titles etc). I use both SDI outputs on it to send key and fill to the vision mixer. The 2nd ultrastudio attaches via thunderbolt to the NUC. Program output from the vision mixer gets sent to this over SDI. The NUC is dedicated to streaming only. It can comfortably stream at 1080p30 or 720p60. I use Xsplit for this purpose. The hyperdeck mini records my show. Smartview Duo is set up with the NUC screen on the left and vision mixer's multiview on the right. The above setup doesn't require additional cooling as long as the ambient temperature in the room isn't too high. Many people are using ProPresenter with the alpha module for lower thirds and that works great. Another less expensive solution is to use the SimpleSupers.com app that uses PowerPoint on Windows as a character generator. It generates an alpha channel so you can have key and fill into your Upstream or DSK. You have animations and transparency. We use it at our church every week. MambaFiber.com wrote: The extra aux outputs of the 1, 2, and 4 M/E products can make it much easier to generate feeds for your multiple destinations. The TVS HD range have an additional 4 program outs. ( Intended as returns for BMD camera control) but if ur not running with BMD cameras these can be used to feed additional recorders, streamers etc. All be it fixed as program out.